Stationary Air Compressor Market size will surpass USD 30 billion by 2024; according to a new research report by Global Market Insights, Inc.
Stationary air compressor market will be driven by increasing automotive production in Asian countries. They are incorporated in automotive air conditioners and are used in almost all manufacturing activities around the globe. The advancements & developments in the North American mining and oil & gas sector will be another driving factor for stationary air compressor market growth. They are used to operate pneumatic equipment, oil extraction, refining, pipeline transportation, etc. Moreover, substantial growth in house hold appliances industry in Asian region due to the positive GDP growth rates, industrial development and upsurge in personal income level will positively spur the product demand. This is all due to the extensive usage of the product in air conditioners, refrigerators and other home appliances. Adoption of portable air compressors by oil & gas and other manufacturing industries is the key restraining factor for stationary air compressor market growth in future. The portable product is comparatively cheaper than the stationary one and provides ease of handling and high power & capacity, which will negatively affect the entire industry by 2024. The global air compressor market is segmented on the basis of technology, lubrication, and application. Based on technology, the market is categorized as rotary, reciprocating, and centrifugal. In terms of revenue, centrifugal technology based stationary air compressor will generate over USD 12 billion in coming year owing to its high capacity, large discharge rates, continuous operation and other mechanical features. Based on lubrication, the industry is segmented as oil free and oil filled air compressors. Oil free products will generate revenue more than USD 9 billion by 2024 owing to its high usage in healthcare sector. The product offers contaminant free compressed air and employed in diagnostic tools such as blood-analyzers, endoscopy equipment, mammography X-ray, and related tools. 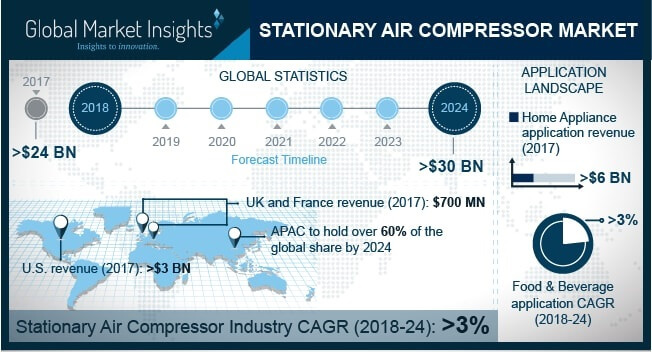 Based on application, the stationary air compressor market is segmented into eight sectors including home appliances, food & beverage, oil & gas, energy, semiconductor & electronics, manufacturing, healthcare, and other applications such as mining, construction, agriculture, water treatment, entertainment, etc. The manufacturing application segment includes automotive, aerospace, glass, wood products, and other general manufacturing practices. The healthcare application segment includes medical, dental, and other healthcare applications such as diagnostics, laboratory, etc. Among these, manufacturing application segment will generate revenue of around USD 8.5 billion in 2024 due to the extensive usage of the compressed air for operating & monitoring equipments, tools, etc. Asia Pacific is the dominant region in the entire segment and will capture over 60% of the global stationary air compressor market. High growth in manufacturing activities, significant production of automotive parts in China coupled with upsurge in household appliance industry are the key driving factors for regional stationary air compressor market growth in coming years. The key stationary air compressor market players are Atlas Copco, Hubei Teweite Power Technology Company Limited, Sullair, Zen Air Tech, Kaeser Kompressoren, Saylor-Beall Manufacturing Company, and Ingersoll-Rand.